Why is Mallorca on our list of Best Beach Holidays? Because of a well-kept secret bay on this Spanish island just off the coast of Barcelona. Bypass Mallorca’s capital Palma and head straight to the north coast of Mallorca and the beautiful curving sweep of Puerto Pollença (pronounced Pollensa). This is a charming traditional Spanish port with a sweeping bay and promenade full of quality cafes, shops and bars near the beach. The ambience and charm of this little seaside village makes it a perfect inclusion as a Best Beach Holiday. By day you can take the short trip into the bigger town of Pollença, which has plenty of shopping and restaurants. Make sure you go to the Sunday market in the Pollença town square, where you’ll find colourful stalls with everything from fresh fruit to French fashion. Eating al fresco in this warm Mediterranean climate is a real treat as you watch the world go by, especially in summer when it stays light until around 10pm. Restaurant menu prices are very reasonable by European standards. Even though the introduction of the Euro has forced up prices, the Malllorca restaurants are some of the most inexpensive in the Mediterranean. There are many festivals in Pollença including bonfires in January, El Pino the next day when a huge pine tree is dragged through town, the annual carnival in February and dancing in the streets in July to honour the patron saint of Mallorca. Movie stars including Michael Douglas and Catherine Zeta Jones have houses in Mallorca. The holiday place to be in Mallorca Island really is near the beach at Puerto Pollença with its beautiful sweeping vista. Without a doubt the star of the beachfront promenade is the stylish "Hotel Illa d’Or", where author Agatha Christie enjoyed staying and writing about. The Hotel Illa d’Or is perfectly located in Puerto Pollença at the left hand end of the beach promenade, far enough away from the noise of the café strip but close enough to lazily stroll there. 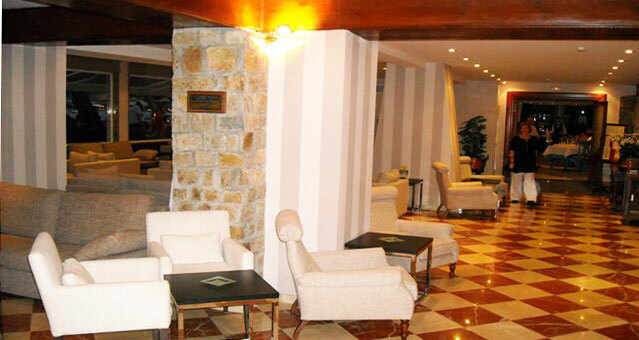 The hotel restaurant that seems to sit out over the sea is superbly located by the shade of the huge pines, and the interior of the hotel itself is pure Spanish class, with refined lounge areas and rooms with ocean views that don’t cost the earth. Double hotel rooms at the Illa D’Or range from 103 Euros in low season to 187 Euros in peak summer, and you pay an extra 30 Euros for half board. What a way to spend a week! The Illa d' Or hotel manager Miguel Salom is one of the most personable people on Mallorca, and although he maintains the privacy of hotel guests, you may bump into famous visitors including singers Ricky Martin and Annie Lenox and actor Jane Seymour. Celebrities are all drawn here to the crystal clear water and fine beaches that are the jewel in the crown of Mallorca's coastline. 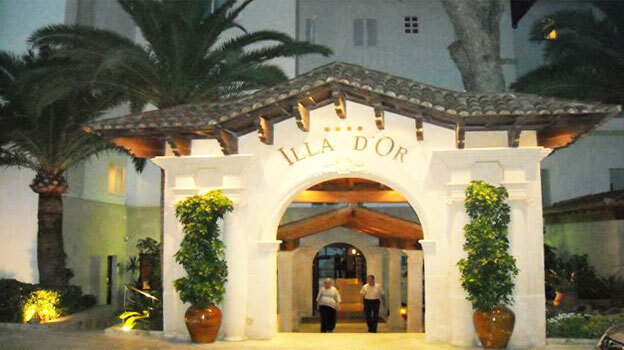 Hotel Illa d’Or is one of those gracious historic hotels on the beach (dating back to 1929) that has it all. This really is the focal point of enjoying a great beach holiday in Mallorca. It will take you a good 45 minutes to drive to Puerto Pollença from the capital Palma. This is where taxis get expensive at 40 Euros each way. Our great value tip is to hire a car at one of the many rental stations at Palma Airport. Mallorca’s airport is one of the busiest in Europe, and when you arrive you’ll find the red and white of "Air Berlin" dominating the runways, thanks to the German influence in Mallorca. It is truly a pleasurable experience flying Air Berlin with typical German efficiency - your flight will almost certainly leave on time and often arrive early, unlike competitors like Easyjet. Air Berlin flights on modern jets are inexpensive, feature assigned leather seats and have good leg room, which is rare in the modern discount air fare market. Often you’ll pick up a bargain on the Air Berlin website at www.airberlin.com for as little as 30 Euros to fly just about anywhere inside Europe. Remarkably, Air Berlin flies in to Mallorca from 60 different destinations around the world including New York, London and Paris, and also from the Spanish mainland. A great way to arrive in Mallorca is to fly in from nearby Valencia on the Spanish coast, where you’ll find wonderful seafood paella restaurants like La Alegria de la Huerta on Valencia’s white sandy beach. Paella was invented in Valencia, a pretty city with those famous Valencia oranges everywhere. After the atmosphere of paella on the beach, take the half hour flight to Mallorca with Air Berlin. When you arrive in Mallorca, sure – check out the capital Palma, but your time is better spent on the northern side of the island at Puerto Pollença or the resort beach at Fomentor, 10 kilometres away. If you really want to stay in the capital Palma, look at C’an Pere Antoni beach and a few others along the Badia de Palma include Palma Nova beach, with its attractive green foliage hiding a few of the resort hotels. There is another pretty beach with fine white sand and clear water at Magalluf to the south and west of Palma, but this is now popular with brash young tourists who like very loud music into the early hours of the morning. When you arrive in Mallorca, head straight to Puerto Pollença, slip on your beachwear and enjoy what is truly one of the world’s Best Beach Holidays.